The economic currents of the Panama Canal expansion are swirling around Florida from its seaports to much of its infrastructure. Since the announcement of the Panama Canal expansion in 2006, shock waves have been felt by businesses and ports around the world of the economic opportunities this portends for trade. At just 1,162 miles from the Canal, Florida is sitting pretty in terms of direct benefits from the expanded Canal, scheduled for completion in late 2015 (barring further delays). The Florida peninsula is the only state to directly border the Atlantic Ocean and the Gulf of Mexico. Port Miami is the first port of call and, on the Gulf side, Port Manatee and Port Tampa Bay are also gearing up. Simply put, Florida ports are the closest to the Panama Canal. And all 15 ports are looking at economic ripple effects, whether direct or indirect from the increased cargo via the Canal. Port Miami will be the first Florida port to reach a depth of 50 feet. Given the lack of federal funds for ports in recent years, Florida has stepped up under the leadership of Gov. Rick Scott, and the state is taking care of business when it comes to its infrastructure and especially seaports. Wheeler noted that most of the state funds are matched 50/50 by the ports, which makes the investments even more impressive. 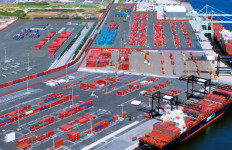 He cites, for example, the Port Tampa Bay container yard improvement project that received $10.4 million and was matched by the port, resulting in a total investment of $20.8 million. Since the voters of Panama overwhelmingly voted (80 percent) to widen and deepen the 50-mile Canal in 2006, the world has been watching, waiting and making preparations. It’s a global event—trade routes are being scrutinized, larger ships are being ordered and built, and countries and ports are all competing for a share of the bounty that will come from the enlarged Panama Canal. The project, now estimated at nearly $7 billion, will encompass a new set of locks—known as “Panamax”—that will allow ships of 1,400 feet in length, 180 feet in width and 60 feet in depth to pass through. 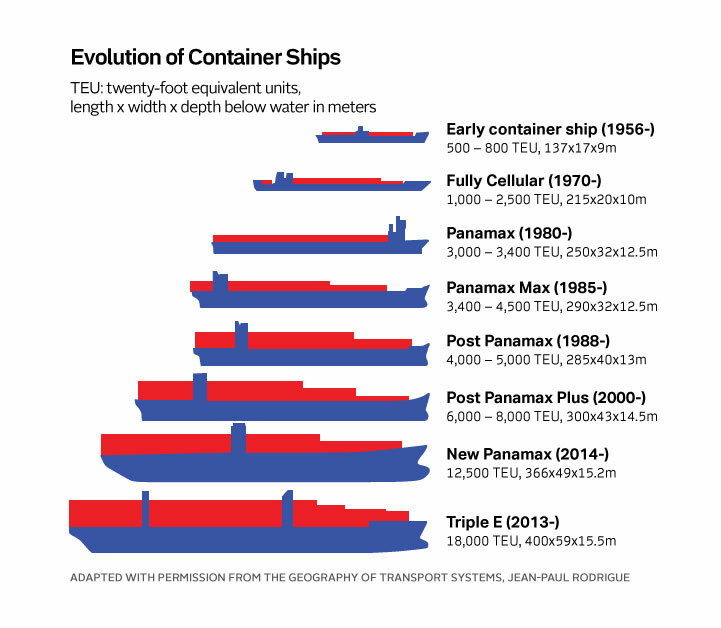 Current ships have a cargo capacity of 5,000 TEU, or twenty-foot equivalent unit (a measure of cargo capacity). After the widening that number will increase to 13,000 TEU. The new vessels will be able to carry 12,600 20-foot containers. While no one has a proverbial crystal ball when it comes to the ultimate economic impact from the expanded Canal, even if Florida does not capture as much new trade as anticipated, it is still a win for the state. New infrastructure is critical to economic development and even a small movement in cargo from the Panama Canal will result in hundreds of millions of dollars. If the ports did not dredge to deeper depths and upgrade, they would not be a player and by extension would be out of the game entirely. The Canal had to expand in this era of extremely large ships. Back in 1914, the year the Canal opened, U.S. Navy ships narrowly fit through the waterways. By 1996, three years before the U.S. handed control of the Canal back to Panama, full-fledged Post Panamax container ships were introduced. Applying the principle of economies of scale to maritime transportation: the larger the ship, the lower the cost per unit transported. The larger container ships are already navigating the Suez Canal. “You can’t say unequivocally if you go to 50 feet you’re going to get all this business from the Canal. But I can assure you that if you don’t go to 50 feet, you will definitely not get the business,” says Wheeler. He sees the investment in the state’s port infrastructures as keeping Florida competitive and viable in the new “wave” of supersized container vessels. 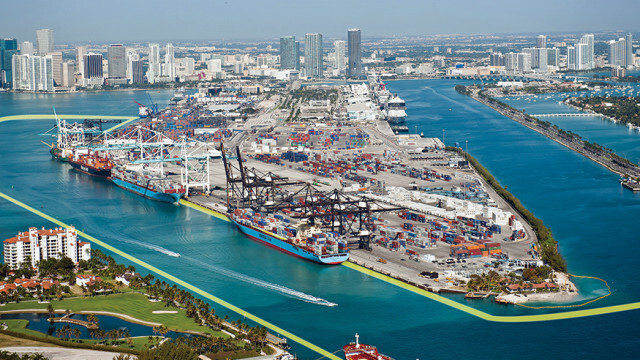 PortMiami is undergoing a $2 billion expansion and improvement. The dredging of the channel entrance from 42 feet to 50 feet began in January. Scott provided $112.5 million for the $220 million, 18-month dredging project. Panamanian President Ricardo Martinelli visited Miami last November and advised ports along the East Coast to follow Miami’s lead and dredge to 50 feet or become irrelevant. Most massive construction projects have encountered difficulties and the Panama Canal is no exception. Given that the original Canal took nearly 32 years to build, from conception to completion, this project has hit a $1.6 billion bump in the road. The original opening was to coincide with the Canal’s Centennial celebration this summer. However, it has been pushed back to late 2015. Currently there are concerns the opening may be pushed back further due to a dispute between the consortium contracted for the work and the Panama Canal Authority (PCA). While it has been reported problems arose in 2010, the dispute went public in January. The Grupo Unidos Por el Canal (GUPC) is led by Spain’s Sacyr SA and Italy’s Impreglio. A $1.6 billion cost overrun has landed both parties in arbitration. 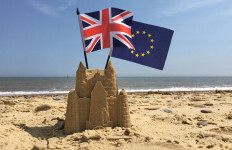 A key issue is whether the two sides can work it out or whether the project will be completed by another consortium. There have been conflicting media reports about the work slowing down or being stopped outright. PCA feels the consortium purposefully underbid ($1 billion lower than U.S. firm Bechtel). Meanwhile the consortium blames problems on studies by Panama before work began, resulting in excavation problems in getting the basalt it requires to make its cement. Cement is a very important material as the expansion will require 4.3 million cubic meters of concrete. “Panama has the resources and will finish work by 2015, regardless of what happens—rain, thunder or lightning,” Panamian President Martinelli said at the World Economic Forum in Davos, Switzerland, in January. With the world watching, most officials are confident the project will be completed in 2015. Prasad and others noted that much of the construction has already occurred. Any company in the world is going to seek the cheapest route for product distribution. Getting from Point A to Point B in the most cost-efficient method will always be the guiding principle. Ships being able to sail to Florida from Asia via the Panama Canal, instead of embarking at West Coast U.S. ports and then spending money on inland transit, will be less expensive. 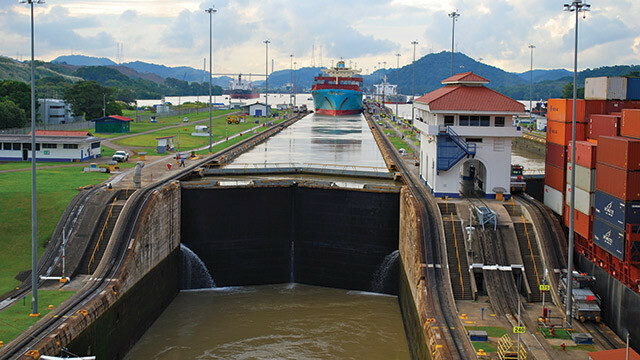 U.S. importers may also look to the Panama Canal versus the Suez Canal for time-saving, shorter routes. Companies that will benefit are those that move goods from Asia to the U.S.
Copenhagen-based A.P. Moeller-Maersk, the world’s biggest container-shipping company, and Beijing-based China Ocean Shipping Group Co. are prime examples. Transportation companies may be able to cut transport costs as much as 30 percent by sending bigger ships through the Panama Canal. Ninety percent of goods that come to Florida arrive by water. In only 48 hours goods can arrive to any destination on the East Coast and the Midwest. Florida is also gaining in population and is expected to surpass New York this year as the third most populous state. (See Page 10.) There are more than 19 million consumers in the Sunshine State. While California is No. 1 in population at 38 million, its West Coast ports are aware of the potential ramifications of the Panama Canal expansion. It has been reported that in Los Angeles, the busiest container port in the U.S., officials are spending $1 million per day to improve infrastructure and defend their market share. Another important feature of the Panama Canal expansion is the ability to export U.S. natural gas and crude oil to markets in Asia. The latest data shows that the U.S. is the world’s biggest producer of natural gas. U.S. natural gas is inexpensive when used domestically, but it must be frozen and liquefied to be piped onto tankers for global export. Without the Canal expansion, U.S. tankers would have to pass the Cape of Horn at the southern end of South America to reach Asian markets. In addition to being a longer route, it is also significantly more expensive. Currently only about 6 percent of the world’s LNG (liquified natural gas) tankers can pass through the Canal. After the expansion, it will accommodate about 90 percent of the tankers. Placed into service in 2002, the 745-mile Gulfstream pipeline originates in Mississippi, continues to Coden—a fishing village near Mobile Bay, Ala.—and runs natural gas under the Gulf of Mexico to the sea at Port Manatee. Air Products opened a manufacturing facility adjacent to Port Manatee in January. The 32-acre site next to the port will cut transportation costs as it is just one mile from the plant to the port docks. The company’s proprietary technology processes and cryogenically liquefies natural gas. Clean Energy Fuels opened the first LNG fueling station in Jacksonville, where it will supply maritime vessels and heavy duty trucks and trains. One of Jaxport’s goals is to become a leader in liquefied natural gas, and it will also be dredging the St. Johns River Channel to 47 feet to accommodate larger cargo ships. In addition to preparing for new larger ships, Florida is also focusing on increased manufacturing. “We saw a lot of cargo ships leaving empty, so we rolled in manufacturing opportunities for the state,” says Prasad. On a recent trade mission to Panama, Secretary of Agriculture Adam Putnam was working on an agriculture deal with the Panamanians to export blueberries and strawberries. Putnam wants Florida farmers to take advantage of an influx of new ships to Florida ports by putting their fruit on the outbound freighters. Manny Mencia, senior vice president of international trade and business development for Enterprise Florida, feels energized when it comes to manufacturing. 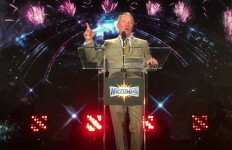 He believes Florida has a tremendous infrastructure to support the international business: “We’ve been one of the fastest growing exporters in the nation as an origin export.” He also touted an Enterprise Florida program that helps Florida companies with export diversification to identify second and third export markets. Wheeler would love to see companies relocate to the state that can take advantage of the improved infrastructure. “So bring a company to Florida that wants to manufacture a product that needs to utilize an airport in order to get a component in, put the piece together and then put it on a ship and send it to China. Let’s attract businesses that need to use our ports and airports,” he says. Beginning in April, the state senate approved the governor’s initiative to provide Florida manufacturers with an exemption on sales taxes on new machinery and equipment bought for use in their factories. While the depth of water is critical to accommodate the bigger ships, there also remains all the infrastructure requirements to offload cargo, transport and store, and distribute. PortMiami has invested $39 million from the state and county to purchase four Super Post-Panamax cranes with the capacity to handle the new class of megaships with a cargo capacity of more than 10,000 TEUs. PortMiami’s nearly $1 billion tunnel project (120 feet below sea level) is also in the works and expected to be complete this May. It will allow trucks to bypass downtown Miami, resulting in twice the traffic capacity to the port. Port Manatee has extended berth capacity and container storage space. Within the next 10 to 15 years, the port plans to develop its north side as a draw for additional container shipments. Port Tampa Bay has been preparing for Canal-borne cargo, including the construction of a new container terminal and the purchase of Post-Panamax cranes. Port Canaveral also continues to develop expansion plans. In addition, seaports are teaming up with private partners and regional governments, as well as the state, and building ramps and access roads, overpasses and underpasses, rail linkages, and intermodal container transfer facilities and logistics centers. Flying under the flag of Panama, the MSC SAMANTHA container ship lists Port Tampa Bay among its destinations. Ultimately when it comes to infrastructure, by virtue of its definition, it is all connected. “I have to thank my boss, Gov. Scott, for recognizing the role infrastructure plays in the vision for our state and its overall role in economic development,” notes Prasad. With that said, while the Panama Canal expansion represents a huge opportunity for Florida to increase its global trade, considering that Florida seaports currently generate 550,000 direct and indirect jobs and contribute $96 billion in economic value to the state through cargo and cruise activities, it’s already a healthy sector. 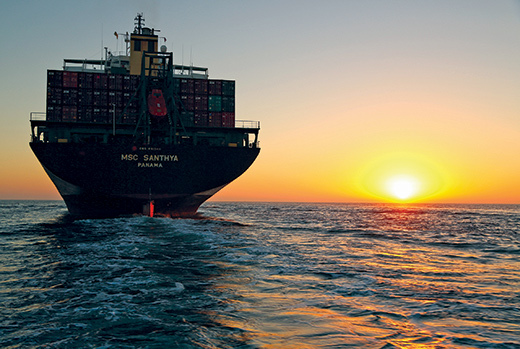 Florida maritime activities account for approximately 13 percent of Florida’s Gross Domestic Product. When you factor in that a recent DOT study confirmed a return on investment of $7 for every $1 invested in port infrastructure, according to Wheeler, it’s not only smart business but a very safe bet for the future. The European explorers who discovered the Americas came by sea to our shores looking for gold. Today, more than 500 years later, we are looking once again to the ocean to seek our own share of riches.